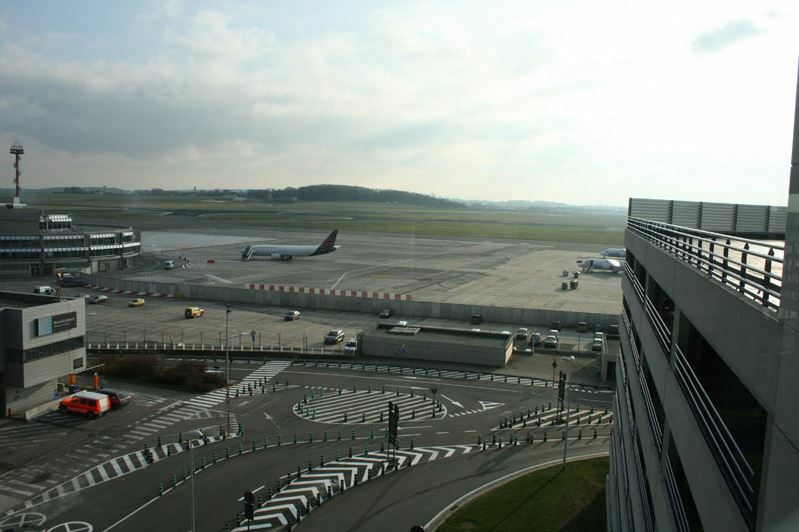 Brussels Airport (IATA: BRU, ICAO: EBBR) is Belgium’s largest airport and centrally located in the economic heart of Europe. 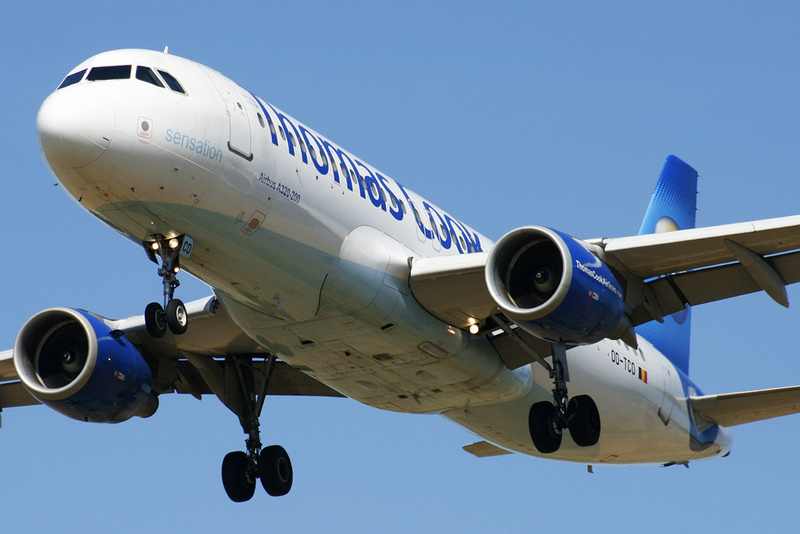 With the city of Brussels being the European capital and home to many international companies and institutions, Brussels Airport is connected to the world by more than 70 airlines. 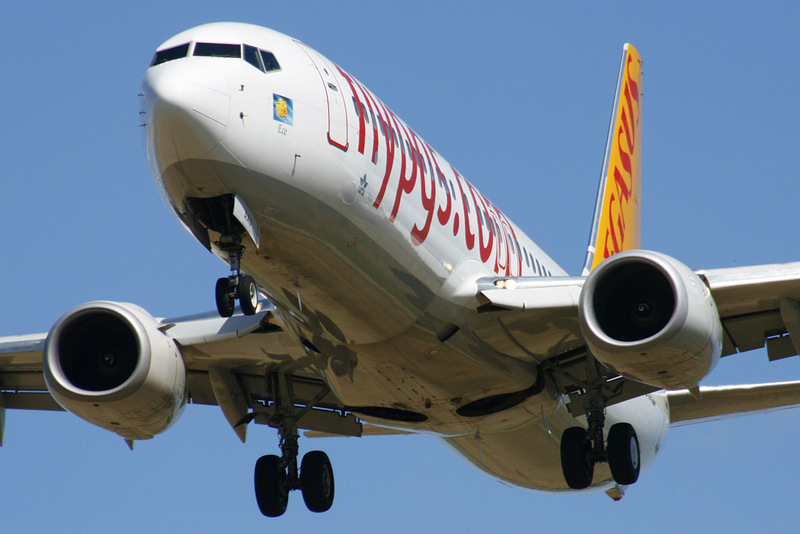 In 2018 the airport received 25,7 million passengers. 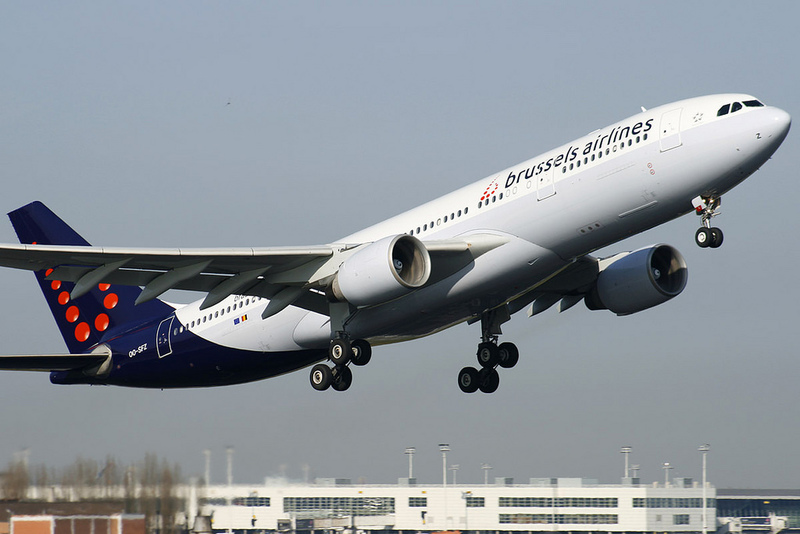 Next to its passenger operations, Brussels Airport is also an important cargo airport, with several cargo operators having their hub in Brussels or operating multiple flights per week to the Belgian capital. 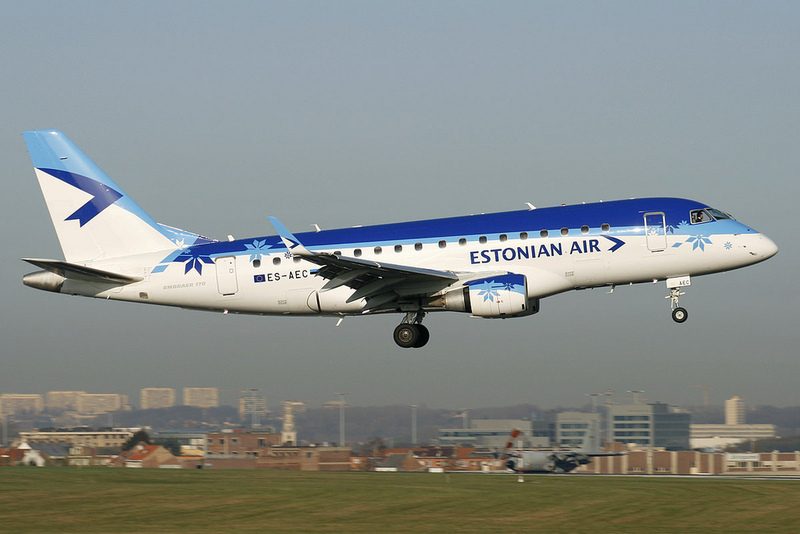 As Brussels is the capital of the European Union and home to the NATO, the airport receives a fair amount of state aircraft as well. Despite being surrounded by other large hubs, Brussels Airport has an interesting variety of traffic and offers some excellent spots for photography. 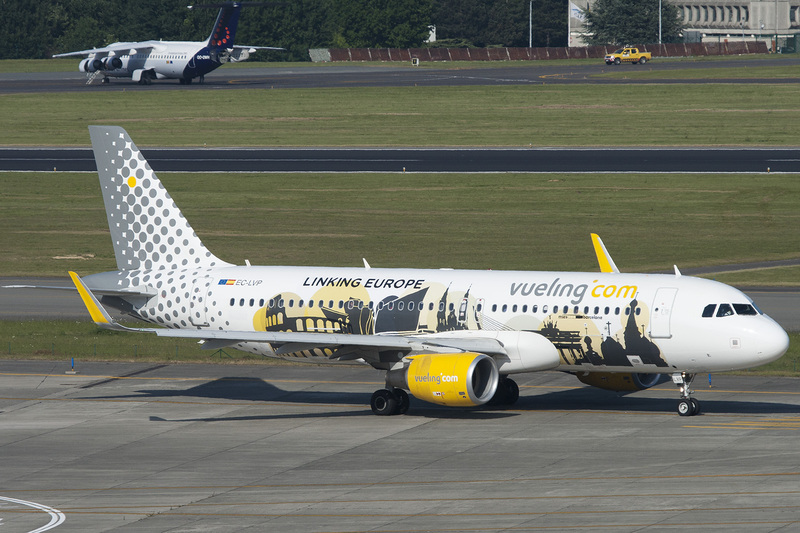 We wish you happy spotting! 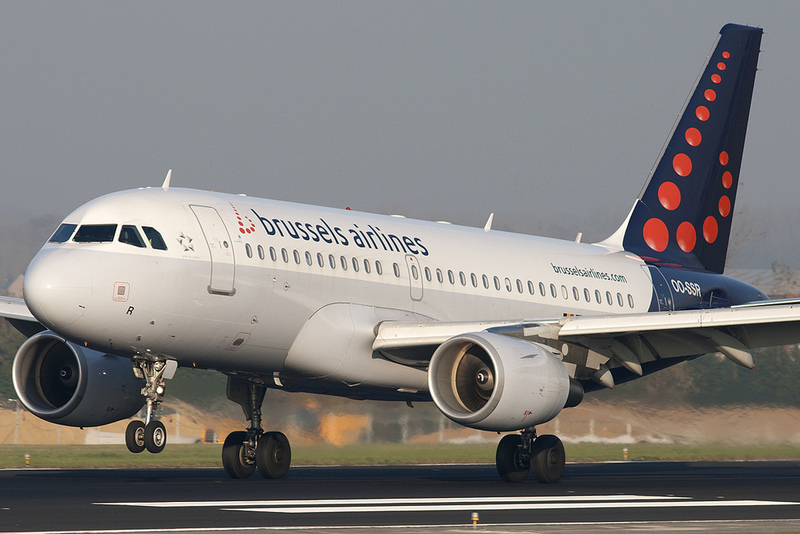 Brussels Airport is the home base for the ‘national’ airline Brussels Airlines and the Belgian holiday airline Tui fly. Another airline that has a base in Brussels is Ryanair. 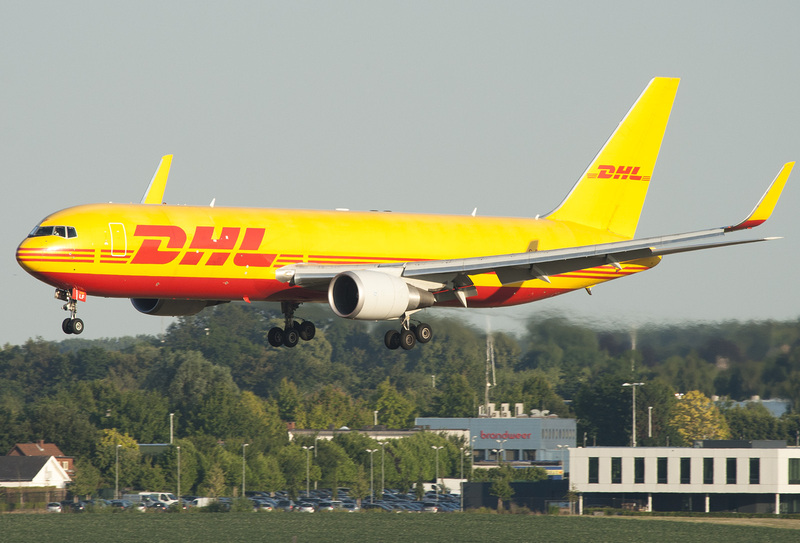 Furthermore, Brussels Airport used to be the intercontinental hub for DHL until the company moved its hub to Leipzig in 2008, but even today Brussels Airport remains an important European hub for DHL. 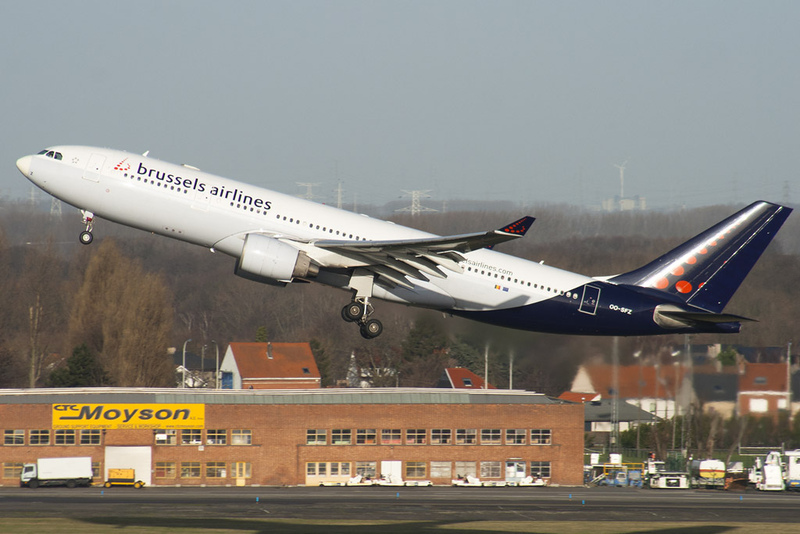 Brussels Airport is a good airport for spotting and photographing aircraft. As from 2017 the airport has 2 official spotting platforms with excellent runway view, which have been built on the most popular spots that were already used a lot. Acces is free and free parking space is available. At Brussels Airport a ladder is not a necessity, although if you want to take photos from different angles and never want any fence on your photos, bringing one with you is an advantage. 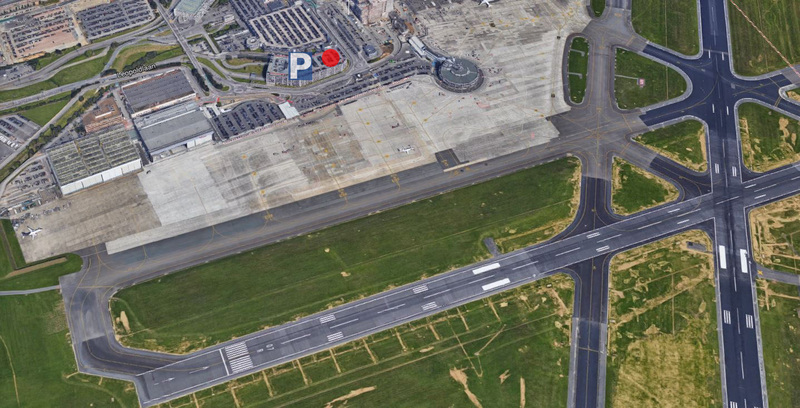 The main configuration used at Brussels Airport is landing 25L/25R and takeoff 25R. 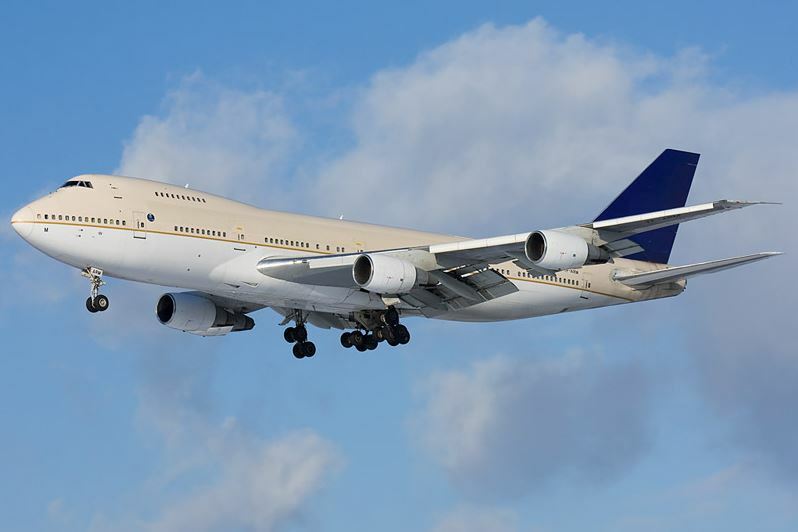 Most of the traffic will be using 25L as the main landing runway, but cargo aircraft or passenger airlines parking at the north side of the A-concourse will often use runway 25R for arrivals. With moderate easterly winds the airport will use a runway 01/07 configuration. This means all traffic will be arriving on runway 01 and all traffic will depart from runway 07R, with the occasional aircraft departing from 07L. Sometimes the airport also uses 07L for landing (VOR approach with a banking turn on final) and 07R for departures, and sadly enough this is now being used more frequently than in the past as the other configuration causes air traffic control restrictions because less capacity is available during peak hours. On top of this page you can find a Google map with all the spotting locations precisely pinned on the satellite map. For arrivals the best time period to visit Brussels Airport is between 07:00 and 11:00 in the morning and 17:00 and 20:00 in the evening. For departures the peak period is between 09:30 and 12:30 and between 19:00 and 21:00. 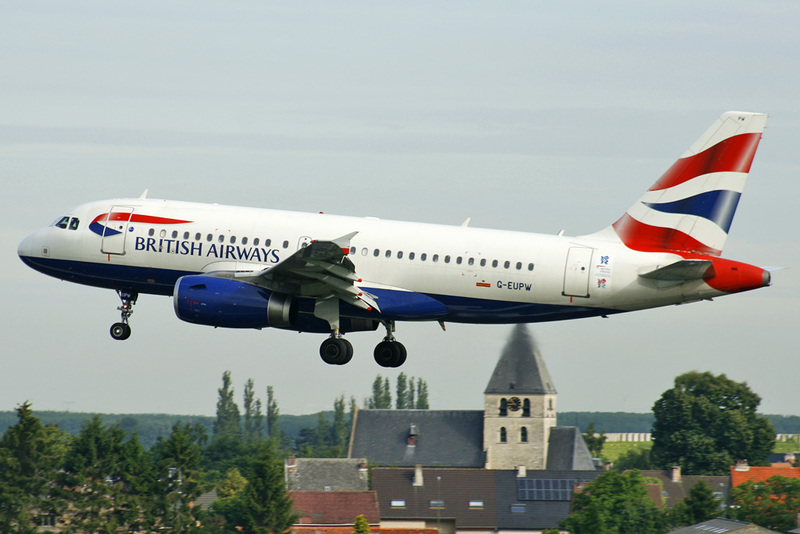 In normal runway configuration (80% of the time), as standard for Brussels Airport due to the dominating westerly winds, aircraft will use 25L as main landing runway and 25R for takeoff. 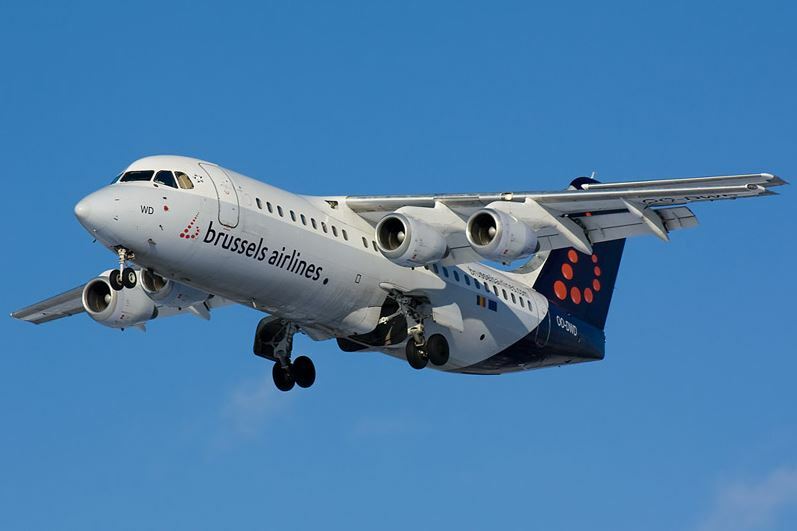 However, in morning rush hour European flights of among others Brussels Airlines often use 25R for landing as well as it gives a shorter taxi time to the north side of the A-concourse. 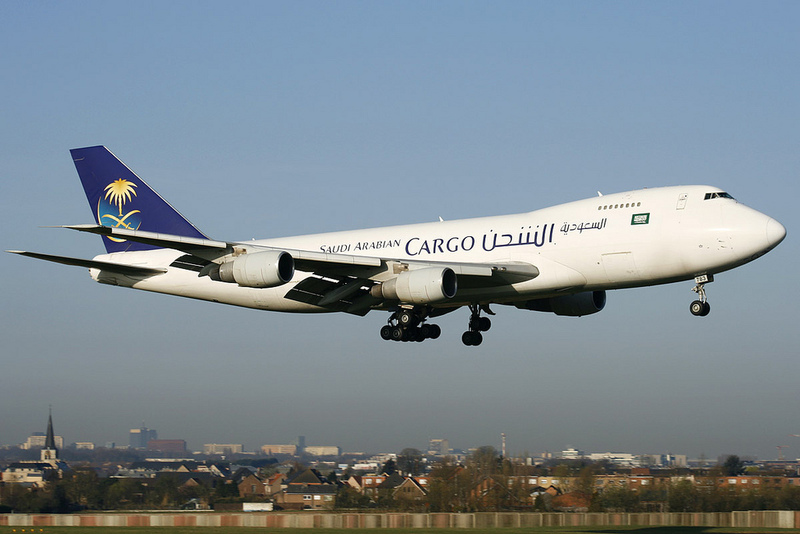 All cargo airlines use 25R for landing as the cargo apron is north of the runway. 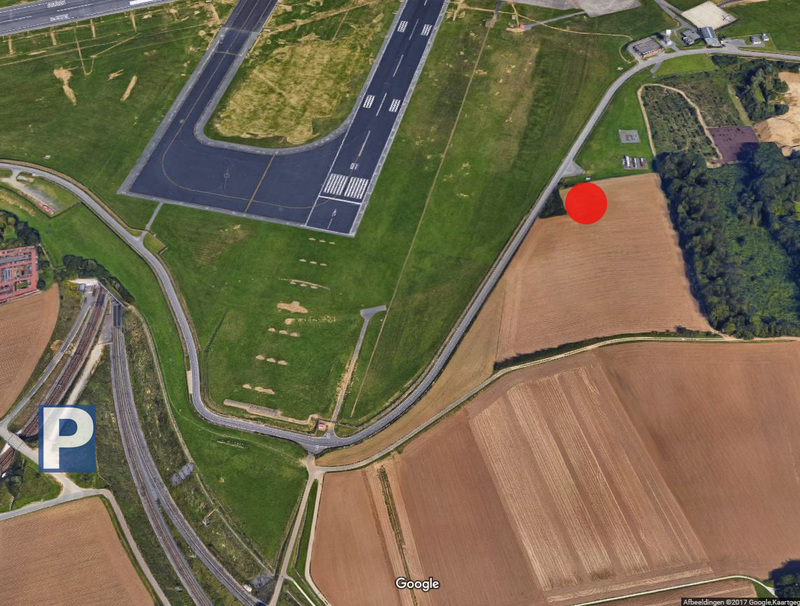 Spot A is located near the approach path of the runway and offers the possibility of making approach shots of aircraft landing on runway 25L. The height of the aircraft is not too high and in fact perfect for those wishing to photograph aircraft from the side or from the front. In summer the sun rises in the axis of 25L, making light conditions not good for the early arrivals as you will have the light coming from the back of the aircraft, darkening both side and nose of the aircraft. Sun position gets better later in the morning and starts to get good as from around 10:00. Around noon, the sun should be at an angle of about 90 degrees to the aircraft, making it perfect for side approach shots. In the afternoon and evening, light only gets better and better for those wanting to make head-on approach shots, as the sunlight shines into the aircraft engines. At around 18:00 the sun crosses the axis of 25L and it is better to photograph from the other side of the runway. Just walk north and cross the approach path. By car: Parking is available on the site. With the opening of the new spotting platforms a small pavement has been contstructed for this spot as well where you can park your car. When coming from the North, cross the axis of the runway and take the first road right. When coming from the South, prior to crossing the runway, take left on the small road. Further down you will see some spaces for parking. By train: Drive to the station of Kortenberg. There you have to exit the station to the north and always continue straight ahead, even on the roundabout. The walk will take no more than 10 minutes. Kortenberg is connected directly by train from all 3 Brussels stations and the city of Leuven with at least 1 train every hour, also during weekends. This spot is good for aircraft photography during a summer evening. Light for this spot gets good as from 18:00, which is a good timing for the evening rush. A large zoom is recommended, around 300-400mm. 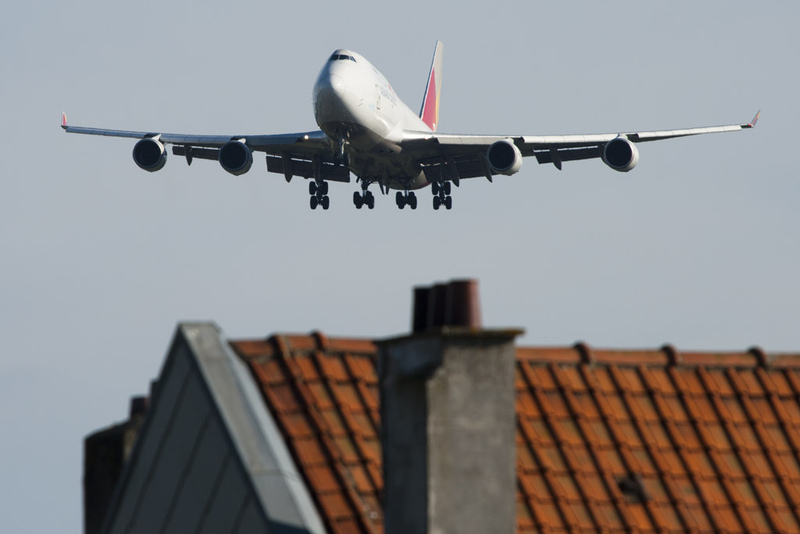 You can photograph the aircraft on final approach for 25L with some background if you desire. By car: Drive to the street ‘Processieweg’ in Steenokkerzeel, which is in a residence area. Free parking is available. Park your car next to the wall and walk into the small pedestrian stroke as shown on this Google street view photo. By train: Not within an acceptable walking distance of a train station. 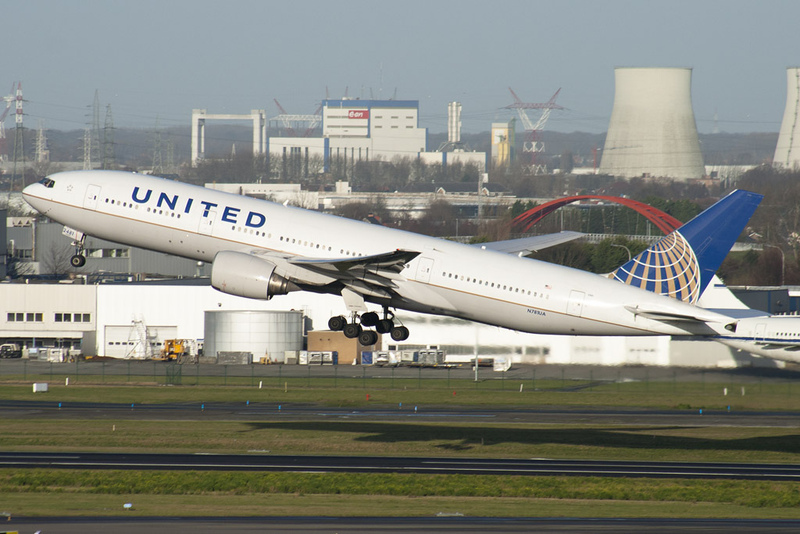 At this spot you can photograph aircraft touching down on runway 25L. 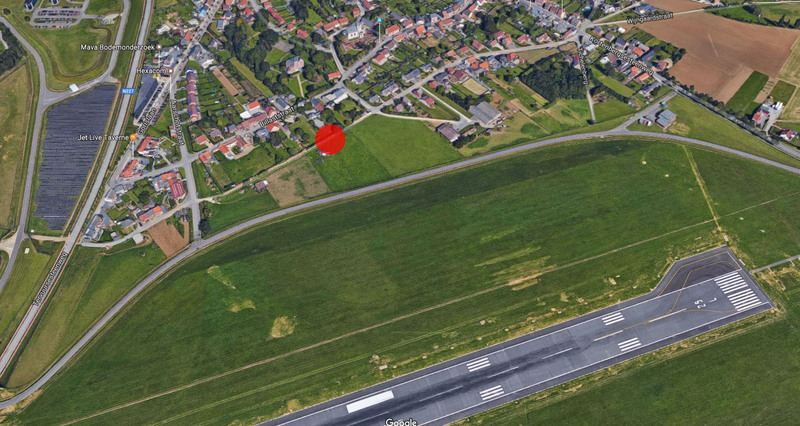 The spot is located just a few meters down the runway from the touch-down-zone. 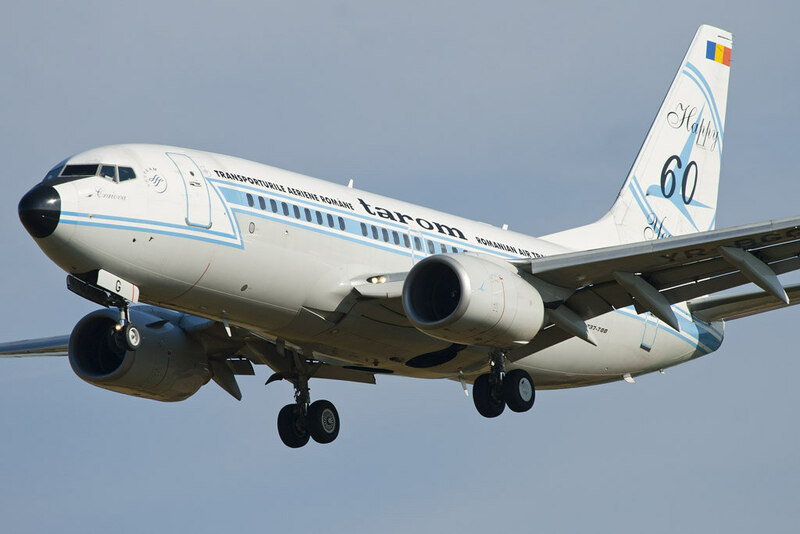 There are two artificial hills (and also 1 official spotting platform) created from the nearby transit centers which offers an elevated view on the runway, allowing you to photograph the aircraft without having to use a ladder. However, without ladder you still might have some fence in the bottom of your photo, depending on where you stand and which view you like to have. Light conditions are the same as for spot A. 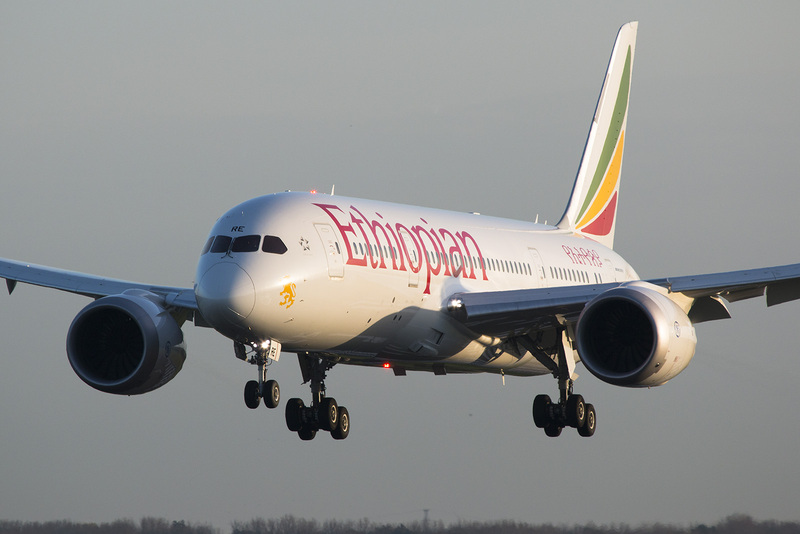 This means that in the morning the sun rises in the axis of 25L, so aircraft will not be perfectly lit and will have dark areas near the nose and side. Sun position however will gradually improve during the morning hours. At around noon the sun is in a 90 degree position with the runway. In afternoon and evening the sun position starts to get perfect for photographing aircraft more from the front, with the sunlight into the engines. With easterly winds this runway is used exclusively as a departing runway for all traffic, except for cargo aircraft. They will most of the time use 07L for takeoff. Nonetheless, this spot is a perfect place to photograph departing aircraft in the morning. Depending on the wind speed, aircraft will rotate slightly ahead of the spot. 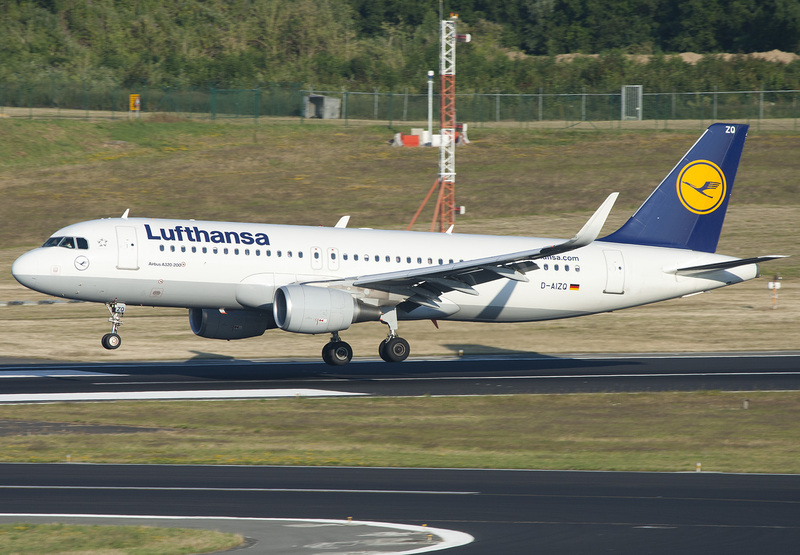 Smaller aircraft tend to rotate quite late down the runway as they will use an intersection takeoff, meaning they don’t start their takeoff roll at the beginning of runway 07R. Light is perfect as from sunrise and will be excellent throughout the morning. As from noon, the sun is at a 90 degree position with the runway, making it more difficult to photograph the departures from the front. This spot can now also be enjoyed from the spotting platform. By car: Drive to the ‘Tervuursesteenweg’ in Steenokkerzeel. You will pass a transit center (127 bis) on your left/right hand side (depending on which direction you are coming from). Turn off onto the access road to this center. At the end of this road you will see 2 hills on the left and right side where you can stand. There is an official parking lot in front of the transit center. With the opening of the spotting platform it is now allowed for spotters to park their car on this lot. By train: If you are by train, you will have to drive to the station of Nossegem. There you’ll have to exit the station to the north and continue straight ahead until you reach the regufee center on your right. Walking time is around 10 minutes. Train station is connected to Leuven and Brussels. This spot has been closed and will not reopen any time soon. 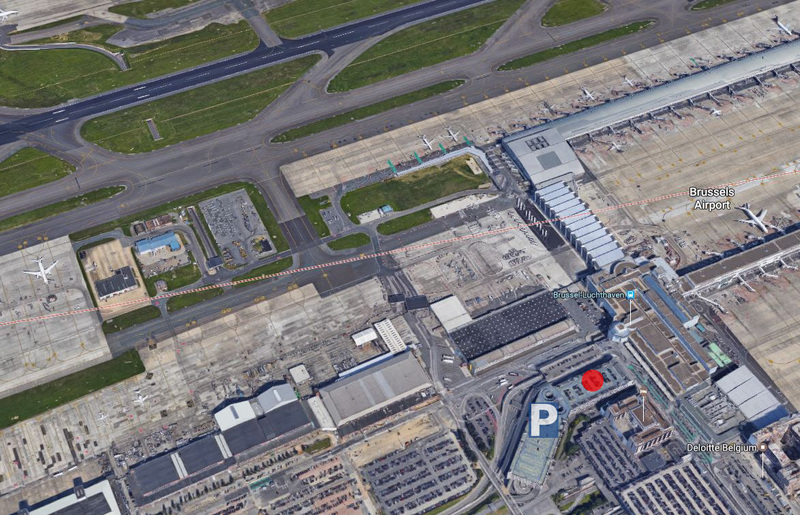 This spot is often referred to as the best spotting location at Brussels Airport. With the eastern runway configuration in effect, all traffic will land on runway 01, including cargo and military aircraft. From this spot it’s also possible to photograph line-ups on runway 01, although this is quite rare and is almost never done. From here you’ll also have a view on departing aircraft from runway 07R, but due to the distance and heat haze photography is difficult. For this spot you need to have a 50-70mm lens if you want to photograph large aircraft from the side. A suitable lens for all aircraft would be somewhere between 50 and 200mm. A ladder is not required for this spot if you don’t mind having a small part of the fence in your photo. Still, a lot of planespotters bring their ladder with them. Sunlight is perfect from sunrise till around 11:00. At around 13:00 the sun will cross the axis of runway 01 and it’s better to move to the other side of the runway. 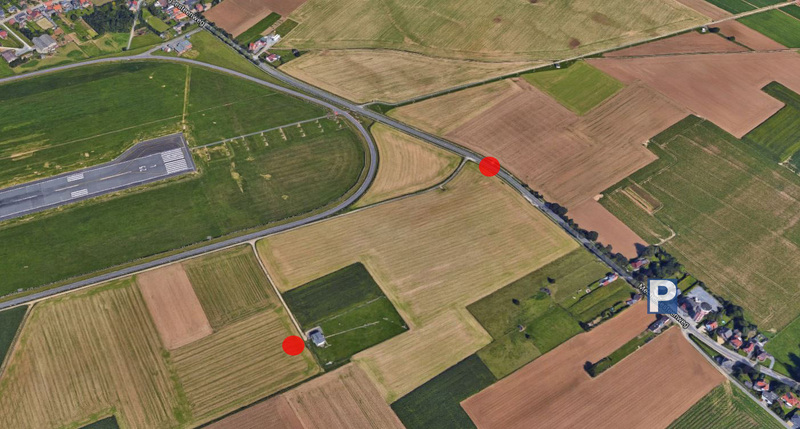 Please keep in mind that to reach this spot, you’ll have to walk over the field of a farmer so please walk as close to the airport fence as possible so that you do not damage the field. When it has rained there is a lot of mud and the field might be slippery. The view is definitely worth the effort. 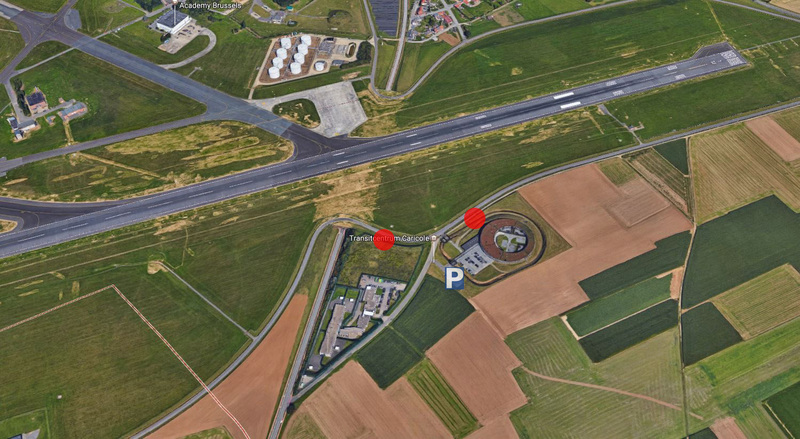 By car: There are parking places available on the west side of the approach path of runway 01. Continue down the road by foot and walk under the approach path of 01. Then you will have to go off the road and walk along the airport fence until you reach a green area on the right side of the runway 01 (near the big forest on the right). By train: Take a train to the station of Nossegem. Leave the platform to the west. From there, you have stairs leading you to the bridge of the railway. Go north and take immediately the grassy pedestrian road on your left. If you follow this road it will bring you to the approach path of runway 01 in about 15 minutes. Located on the other side of runway 01, this spot is good for evening approach shots on runway 01. At 13:00 the light is at its worst, improving in the afternoon and getting great in the evening. All lenses can be used here, ranging between 70 and 400mm. 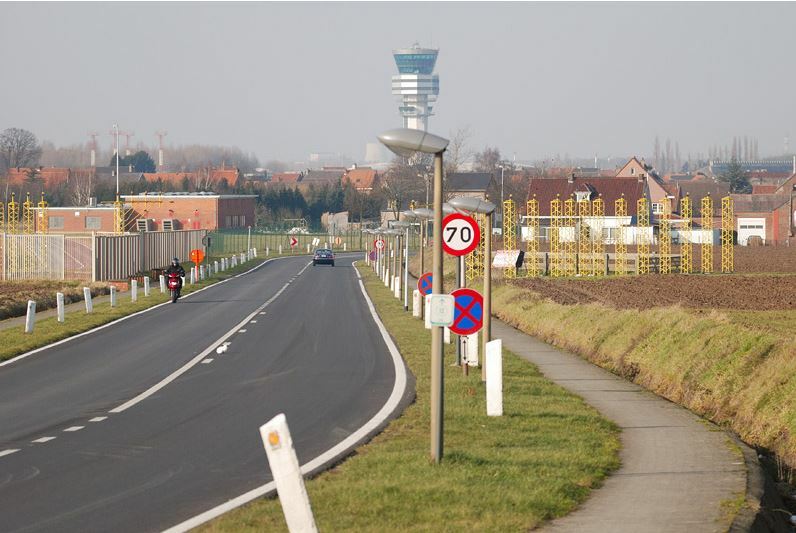 By car: There are parking places available on the west side of the approach path of runway 01. Continue down the road by foot and walk under the approach path of 01. There is a large grassfield on the left hand side. Several locations are possible at this spot. This spot is located on the top level of car parking P3 on the south side of the airport. It used to offer a panoramic view on runway 01 (in front of you) and 25L/07R (to the right), but due to newly constructed buildings the view is now limited. From this spot there are a range of possibilities to photograph depending on your lenses. Anyway, we advise at least 200mm and more will be an advantage. You can photograph aircraft vacating runway 25L, but the best moment for this spot is when 01 and 07R are in use. 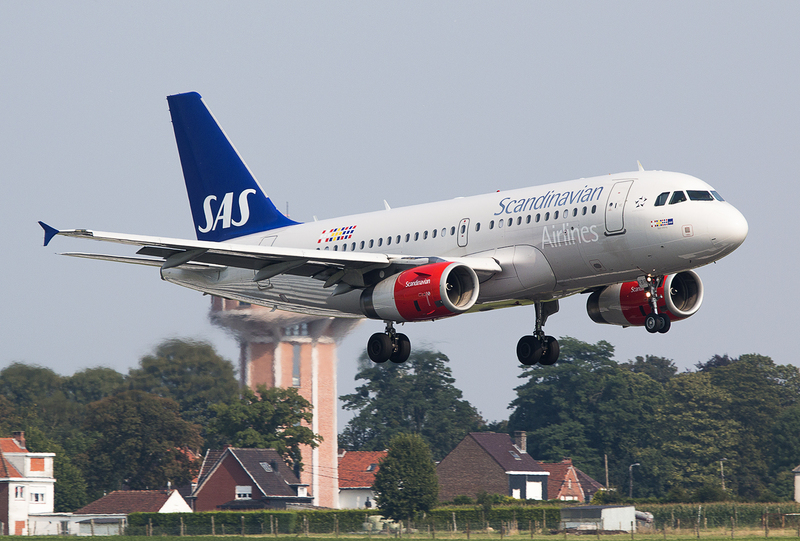 You can photograph aircraft landing on runway 01, just in front of you. Also all aircraft taxiing to runway 07R for departure will pass in front or below you. Light is getting acceptable as from 15:00-16:00, improving during the evening. By car: Once at the airport, follow the signs that lead to parking ‘P3’. Then take the elevator to level 6, which is the top of the parking. Bear in mind that parking your car here is expensive. By train: Brussels Airport has a large train station with direct trains connecting to main cities like Brussels, Antwerp, Mechelen, Leuven, Ghent and Bruges. From the airport station go to the departure level, exit the building and walk to the left along the Sheraton hotel. The P3 parking is next to the Sheraton. Take the elevator to level 6. This car parking is of the same height as car parking P3 and is on the other side of the Sheraton Hotel. From here you’ll have a view on runway 25R, making it the perfect location to photograph departing traffic. However, due to the distance from the runway we advise at least 200-300mm for heavies and 400mm for smaller aircraft. Heat haze will therefore be a factor during spring and summer. As from 0930-1200 it is rush hour at Brussels Airport for departing aircraft. 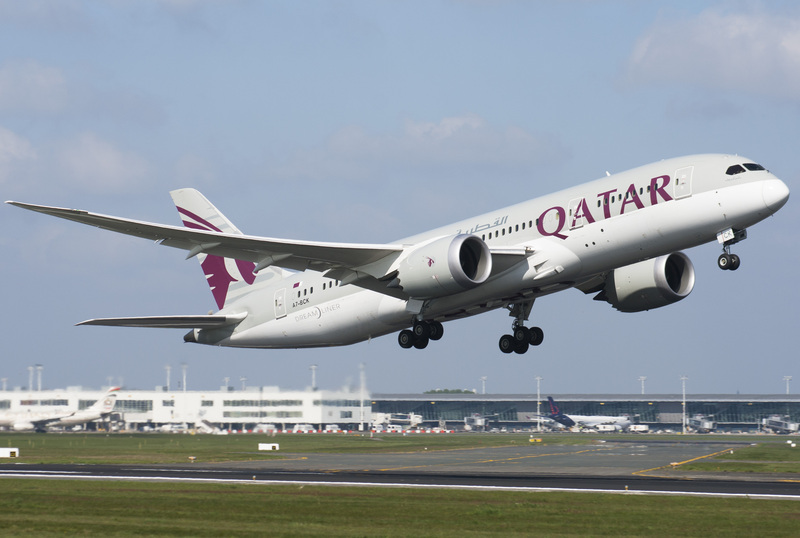 Most of the long haul flights leave during this time span and will rotate in front of you. There are some obstacles that you have to take into account (light poles and wires) but it’s perfectly possible to photograph without any of these on your photos. Just find yourself a suitable spot. Light is good from morning till early evening. By car: Once at the airport, follow the signs that lead to parking ‘P1’. Then take the elevator to level 6, which is the top of the parking. Bear in mind that parking your car here is expensive. By train: Brussels Airport has a large train station with direct trains connecting to main cities like Brussels, Antwerp, Leuven, Ghent and Bruges. From the airport station go to the departure level, exit the building and walk right. The P1 parking is next to the Sheraton. Take the elevator to level 6. This spot offers a view upon the line-up of runway 07L departures, although this is a very rare occasion. 07L for landing or departures is rare, although nowadays this can happen a few times a year but only for a limited period. 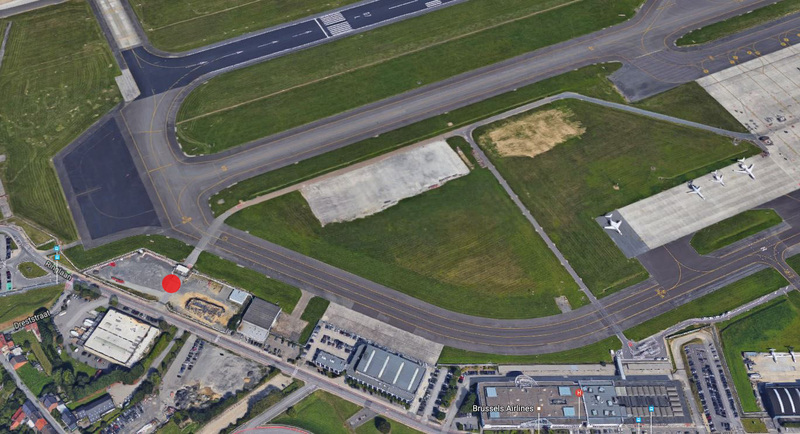 The spot is located across the big Brussels Airlines crew parking. You can enter it for free but you cannot park your car as the parking is only for crew/staff. You can neither park a bit further on the road. 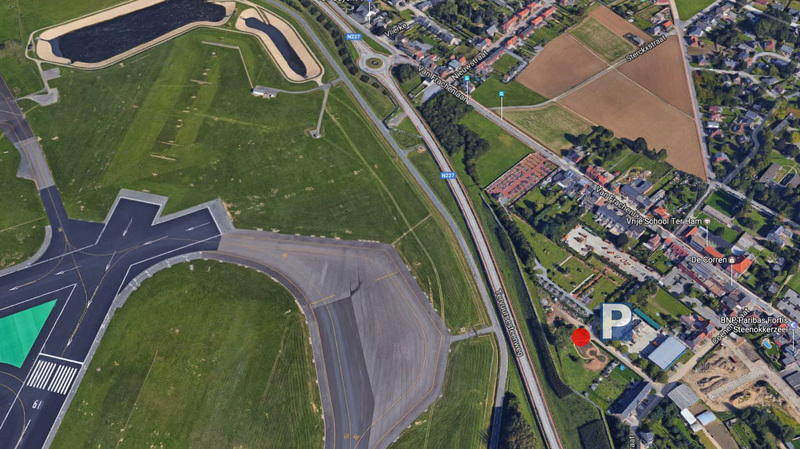 You will have to park at the airport or in the nearby village and take the free bus to this spot and get off at the third stop (Brussels Airlines headquarters) when leaving from the main airport building. 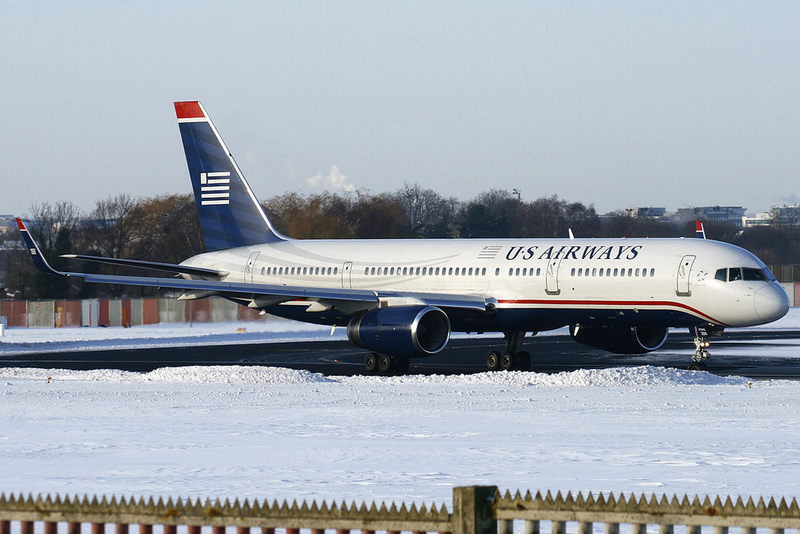 The spot is located some distance behind a bus stop at a fire gate entrance to the taxiway and runway. You can either take pictures over the fence with a stair (at least 1m50) or trough the bars of the fence which are 15cm spaced from each other. You will have a great opportunity to take pictures of departing aircraft on the ground on the taxiway and a good chance to take close-up’s. A 200mm-lens will be enough for the smaller aircraft, larger aircraft will only require about 150mm zoom or less. On warm days you have to take into account the heat haze. Aircraft approaching to runway 07L will have to perform a VOR/DME approach or a visual approach. As runway 07L is not fitted with an ILS landing system in that direction, aircraft will have to approach partly on instruments (VOR/DME) till a certain point and then have to take over manual control and will only establish on the runway axis quite late, resulting in nice bank maneuvers as approaching airplanes have to avoid the city center of Brussels and especially the Royal Palace at Laken. Approach shots are possible starting from sunrise till about 18:00 before you will get too much backlit. 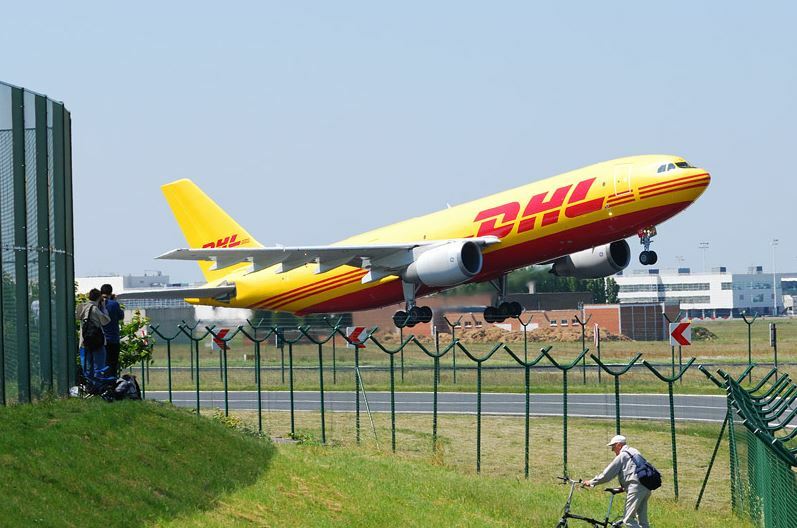 Most of the time only cargo or military aircraft use 25R for landing, besides a few regular airlines like Brussels Airlines, EasyJet and Ryanair who might use this runway as well during morning rush hours. 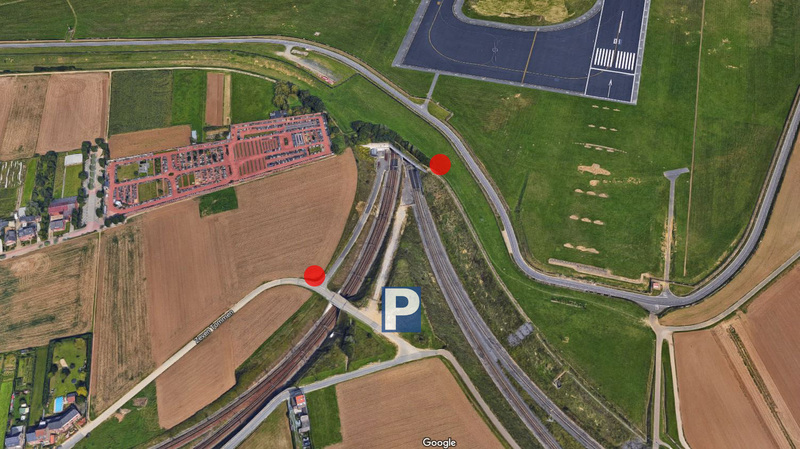 This spot is located in the town of Steenokkerzeel near the ATC tower of Brussels Airport and behind a stone sound wall. 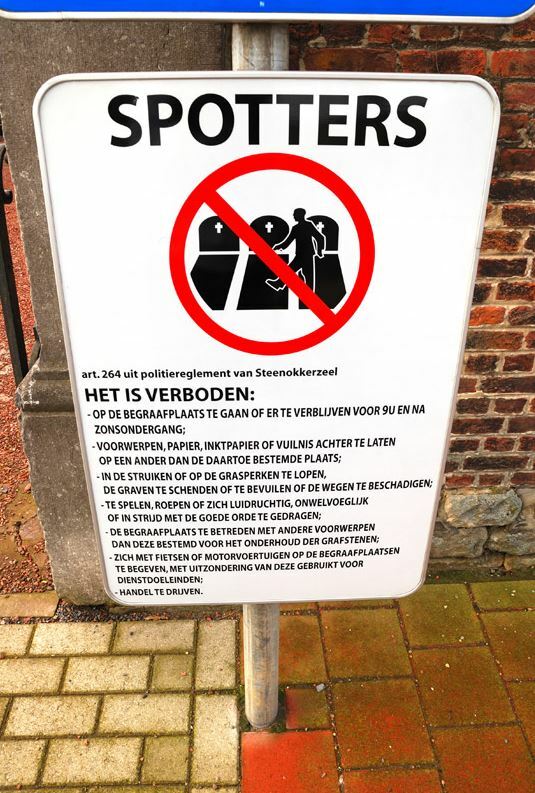 The spot is at the small cemetery of Steenokkerzeel. There is a small road to the cemetery starting from the old road through the town center. Sunlight conditions are the same as for 25L. By car: Parking is available at the cemetery. The street itself is not ‘Coenenstraat’ but when you enter that street, follow the signs to the cemetery, which is the first street to the right. You cannot reach this spot by train, nor directly by bus. There is a bus line running through the village coming from the airport, but you’ll have to use Google maps to find your directions.